Skyray (g. by Smart Missile). 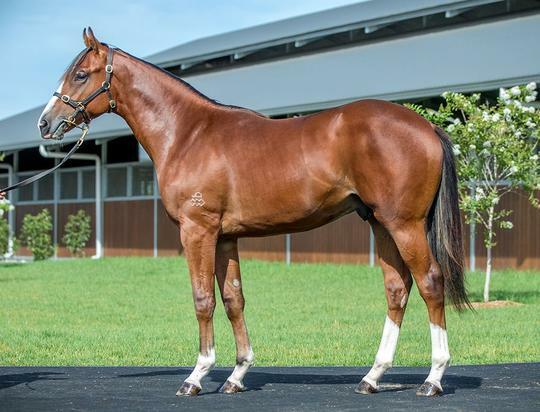 3 wins-1 at 2-at 1000m, 1200m, A$150,630, to 2018-19, 2d Wyong Magic Millions 2YO Classic, RL, 3d ATC TAB H.
Gadfly (g. by Smart Missile). 5 wins to 1250m, A$146,110, to 2018-19 in Aust. Oh Five Glory. Winner at 2, A$155,300, in 2018-19, BRC Mount Franklin 2YO H., 2d BRC Novotel Brisbane Airport 2YO H.
BOMBER BILL (Air de France). 23 wins-7 at 2-to 1400m, A$1,892,330, WATC Karrakatta P., Gr.1, SAJC Goodwood H., Gr.1, MVRC Australia S., Gr.1, AJC Challenge S., Gr.2, MVRC Schweppes S., Gr.2, AJC Liverpool City Cup, Gr.3, VRC Gilgai S., Gr.3-twice, SAJC DC McKay S., Gr.3, RN Irwin S., Gr.3, MRC Rubiton S., Gr.3, WATC Sires' Produce S., Gr.3, 2d MVRC Schweppes S., Gr.2, QTC Cup, Gr.2, VRC Bobbie Lewis H., Gr.3, MRC Rubiton S., Gr.3, SAJC RN Irwin S., Gr.3, 3d QTC Cup, Gr.2. SPECIAL SONG (Song of Tara). 11 wins-1 at 2-from 1000m to 1800m, A$282,800, Qld Tatt's RC Members Cup, L, QTC Easter Cup, Romantic Dream H., BTC Document Destruction H., Alex J Saunders Valuations H., QTC Schneider Electrical H., 2d BTC Bernborough H., L.
DEMOGRAPHIC (Gold Brose). 4 wins to 1400m, A$199,050, VRC Frances Tressady S., Gr.3, MRC Love a Show H., December H., SAJC Nuclear Debate H., 2d SAJC New Year's Gift, L, VRC Maybe Mahal H., MRC Highways Tabaret H., 3d VRC Mark Sensing H., 4th SAJC Swettenham Stud S., Gr.2. Producer. DISTINCTIVE DARCI (Darci Brahma). 9 wins to 1200m, S$913,754, to 2018, Singapore TC Merlion Trophy, L, Korea Racing Authority Trophy, Kranji A S.-twice, 3d Singapore TC Colonial Chief S., L.
EVER LOYAL (Sebring). 2 wins at 1400m, 1600m, NZ$139,875, in 2017-18, CJC Zacinto S., L, 2d ARC Concorde H., Gr.3, Shaws Wires Ropes H., 3d New Zealand Two Thousand Guineas, Gr.1.